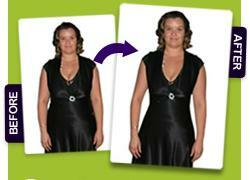 Want to make some impressive weight loss before after pictures and share them online with your colleagues and friends? Or, use them as reminders whenever you’re tempted by that fudge cake? Let me give you first a few useful tips and suggestions for making perfect before & after pictures of yourself. Then, I’ll point you to a cool resource to help you visualize what you will look like thinner, or at your ideal weight – a great tool to boost your motivation and stay on track. But first, let’s see the things you need to make your before and after weight loss pics. You want your photos to be similar, with alike clothing – to highlight the difference in your size. 1) When you take weight loss before after pictures make sure you stand at the same distance from the camera at both times and that the camera is at the same height – preferably at your face level. 2) It’s better to have the same lighting for both sets of pics. If you use daylight, make sure you take the pic at around the same time of the day. Avoid using the flash, as it creates sharp shadows, difficult to eliminate. 3) Use a flat-finish, non-reflective wall as background. Try to minimize the number of objects and the colors around you, as these diminish the effect of difference in your size. If you use a darker background you will not have to deal with shadows that diminish the weight loss effect. 4) Download a handy free software like Paint.net for PC, or use PicMonkey directly online. Both are super-easy programs to use for your weight loss before after pictures allowing you to use all kinds of cool special effects. You can resize, rotate, edit, insert caption text, collage and do just about anything with these simple tools. Now, you’re ready to use your before-and-after pictures to simply show off – or even participate in various weight loss contests. …of yourself at your ideal weight. You’ve surely heard of the power of visualization and that “seeing is believing”, right? Well, Visualize You is a nice (currently free) online weight loss motivation tool, which you can use to see how you will look thinner. Use it as an incentive to drop off the pounds. It helps you stay focused on your weight loss goal. Here’s how to use it. Upload a picture of yourself at your current weight and specify how many pounds you’d like to lose – you’ll get the photos featuring you at your goal weight.